The US Air Force’s fifth GPS Block IIF navigation satellite was launched on Thursday night. Liftoff, from Cape Canaveral Air Force Station in Florida, via the United Launch Alliance (ULA) Delta IV rocket, came at the end of a nineteen-minute window, resulting in a T-0 of 8:59 pm Eastern (01:59 UTC on Friday). The delay in the window was caused by high solar activity. 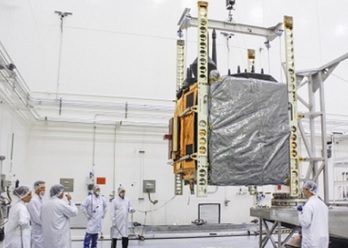 Built by Boeing, GPS IIF-5 is the fifth of twelve Block IIF satellites intended to replace older satellites in the Global Positioning System and introduce new capabilities ahead of the Block III series scheduled to begin launching in the next few years. 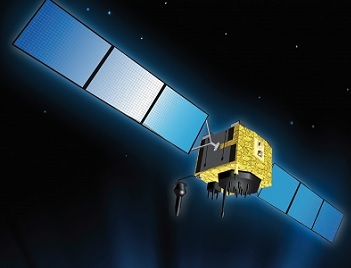 Each satellite has a mass of 1,630 kilograms (3,534 lb) and is designed for twelve years’ service life. GPS satellites operate in semi-synchronous orbits with periods of twelve hours, making two revolutions per day. The constellation consists of six planes, designated A to F. In theory each plane should have four primary satellites in slots one to four, with a spare in slot five, however some planes have more than one backup; some of these satellites are kept operational in “slot six”, while others are in standby status. Destined for slot 3 of plane A of the GPS constellation, GPS IIF-5 is scheduled to replace the USA-135 satellite, also known as GPS IIA-28, which was launched in November 1997. The nineteenth and final Block IIA satelite to fly, USA-135 will likely be moved to slot 5, which is typically occupied by an older, backup satellite. Slot 5 in plane A currently contains USA-92; a twenty-year-old spacecraft which is the third-oldest satellite in the GPS constellation and the oldest in plane A.
GPS IIF-5 is the second Block IIF satellite to be launched into plane A; USA-239 (GPS IIF-3) is currently serving in slot A1 following its October 2012 launch atop a Delta IV. Plane A is the first plane of the constellation to receive more than one Block IIF satellite; IIF-1, 2 and 4 are located in planes B, D and C respectively. GPS IIF-5, which is also numbered GPS IIF SV-5 and has Space Vehicle Number 64. It is expected to be given Pseudo-Random Noice (PRN) code 30. PRN 30 is currently broadcast by USA-203, a Block IIRM satellite launched in 2009 which has never seen operational use due to problems with its signal quality. USA-203, which was launched as GPS IIR-20(M), will be reassigned PRN 06. Block IIF satellites follow on from the Block II Replenishment, or Block IIR, satellites launched between 1997 and 2009. Twenty one Block IIR spacecraft were launched, with the last eight being modernised and converted to the Block IIRM standard. Block IIR satellites were replacements for the earlier Block II and IIA satellites launched between 1989 and 1990 and 1990 and 1997 respectively. Nine Block II and nineteen Block IIA satellites were launched, representing the initial operational constellation. Block I satellites, eleven of which were launched between 1978 and 1985, were never used as part of the operational GPS system, instead serving as in-orbit prototypes. Launched from Vandenberg by Atlas E/F rockets, these spacecraft operated in more highly-inclined orbits than their operational predecessors. Originally developed by the US Air Force for military applications, President Ronald Reagan ordered that the Global Positioning System be made available to civilian users after a Korean Air Lines Boeing 747 was shot down after going off course and entering restricted Soviet airspace. The satellites broadcast freely-available civilian signals, and military ones with greater precision. The rocket that launched GPS IIF-5, United Launch Alliance’s Delta IV, conducted its twenty-fifth flight. Flying in the Medium+(4,2) configuration – its most-used variant – the rocket consists of a Common Booster Core (CBC) augmented by a pair of GEM-60 solid rocket motors, with a four-metre Delta Cryogenic Second Stage (DCSS) mounted atop the CBC. The Common Booster Core is powered by a single RS-68 engine, while the DCSS makes use of an RL10B. Both core stages make use of cryogenic propellents, burning liquid hydrogen in a liquid oxygen oxidiser. The rocket that launched GPS IIF-5 had the flight number Delta 365, indicating that it was the 365th vehicle to fly considered by ULA and its predecessors to be part of the Delta series. This count excludes three suborbital flights using Thor LV-2C Delta rockets which tested reentry vehicles as part of the ASSET program. Also excluded are the rockets built and launched under license in Japan, such as the N-I and N-II. The Delta IV itself has little in common with previous rockets in the Delta series. The Delta IV was originally designed by McDonnell Douglas as their proposal for the US Air Force’s Evolved Expendable Launch Vehicle (EELV) program. Developed by Boeing following its 1997 merger with Douglas, the Delta IV first flew in November 2002 carrying a commercial communications satellite, Eutelsat W5 (since renamed Eutelsat 25C). The Delta IV’s maiden flight remains its only mission whose primary payload was neither funded nor intended for use by the US government. Only three further launches, which carried Geostationary Operational Environmental Satellites (GOES) for the National Oceanic and Atmospheric Administration, wer not conducted for the military. 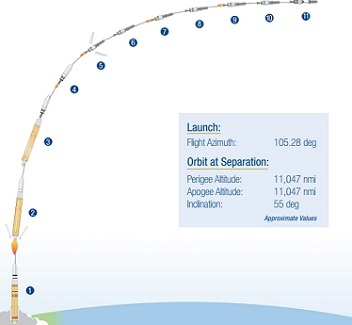 The Delta IV has flown in five different configurations; Medium, Medium+(4,2), (5,2), (5,4) and Heavy. The Medium configuration, which has only been used for three launches, has not flown since 2006, while the Medium+(5,2) has only flown once – in 2012. The Medium+(4,2) is the most-flown version; Thursday’s was its tenth flight. 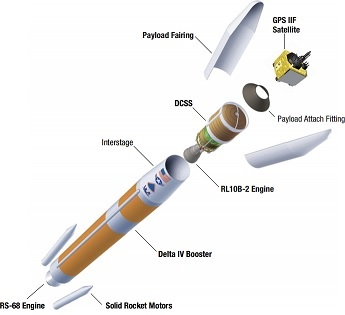 Delta IV has also made seven flights in the Heavy configuration, which features three Common Booster Cores, and four in the Medium+(5,4) configuration. The Heavy configuration’s first flight, in December 2004, is the Delta IV’s only launch failure to date; cavitation in CBC oxidiser lines led to all three RS-68 engines shutting down earlier than had been planned. A demonstration satellite was delivered into a significantly lower orbit than had been planned, while two secondary payloads – student satellites named Sparkie and Ralphie – failed to achieve orbit. 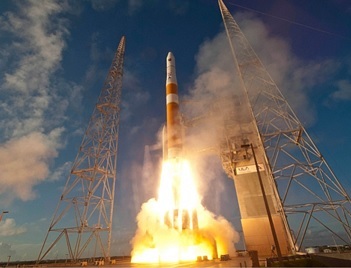 In its operational missions for the US military, the Delta IV has delivered into orbit six communications satellites – two for the Defense Satellite Communications System and four for the Wideband Global Satcom system which replaced it; four Global Positioning System navigation satellites including IIF-5, a Defense Meteorological Satellite Program weather satellite, a Defense Support Program missile detection spacecraft and eight payloads for the National Reconnaissance Office. The NRO payloads are believed to consist of four electronic intelligence (ELINT) missions – three geosynchronous Orion satellites and one Molniya orbit satellite; two KH-11 optical imaging spacecraft, a Topaz radar-imaging vehicle and a Quasar communications satellite. As with any Delta IV launch, Thursday’s mission began with the ignition of the first stage’s RS-68 engine five seconds in advance of the scheduled liftoff. At T-0 the two solid rocket motors ignited, and Delta 365 began its ascent towards orbit. Eight seconds into flight the vehicle pitched over and begin a series of roll and yaw manoeuvres to attain an azimuth of 105.28 degrees. Forty six seconds after liftoff Delta 365 reached the speed of sound, before passing through the area of maximum dynamic pressure 20.4 seconds later. The solid rocket motors burnt out 96 seconds after launch, separating four seconds later. First stage flight ended with Main Engine Cutoff (MECO), four minutes and five seconds after liftoff. The spent stage was jetisonned 7.4 seconds after burnout. After the first stage separated, the second stage coasted for four and a half seconds before it ignited to begin the first of three planned burns. Ten and a half seconds into the seven-minute, 46.5-second burn, the payload fairing separated from around GPS IIF-5, exposing the satellite to space for the first time. At the end of its first burn, the second stage entered a parking orbit. Second Stage Cutoff 1, or SECO-1, began a coast phase lasting nine minutes and five seconds, before the stage’s RL10 engine restarted for the second burn. Lasting three minutes and 17.7 seconds, this burn propelled GPS IIF-5 into a transfer orbit. A final burn, following a further two hours, 56 minutes and 9.8 seconds of coasting, saw the RL10 restart for 97.9 seconds as it raises itself out of the transfer orbit, into an orbit close to that in which its payload will be operated. The mission plan called for a circular orbit at spacecraft separation; 20,469 kilometres (12,713 statute miles, 11,047 nautical miles) in altitude with 55 degrees inclination to the equator. Cape Canaveral Air Force Station’s Space Launch Complex 37B was used to launch Delta 365. 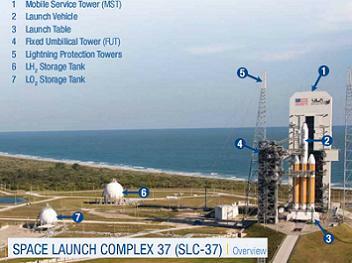 The current SLC-37B was constructed in the late 1990s and early 2000s on the site of an older pad originally built for the Apollo program. The original Launch Complex 37 was designed for use by the Saturn I rocket, and consisted of two pads; A and B. Pad A was never used, however Pad B was used for all six orbital launches of the Saturn I, after its suborbital test flights had been made from nearby Launch Complex 34. Two Saturn IB rockets were later launched from the pad, the last launch being that of Apollo 5; the first test flight of the Lunar Module. Following the launch of Apollo 5 the pad was mothballed in anticipation of use as part of an extended Apollo program once the first lunar landings had taken place. The program, known as Apollo Applications, was ultimately cancelled in favour of the Space Shuttle, with only the Skylab space station being launched. To save money, NASA opted against reactivating LC-34 or LC-37 for Skylab, instead modifying a Mobile Launcher to enable Saturn IB launches from the Saturn V pad at Launch Complex 39B. Following demolition of its towers in the 1970s, LC-37 remained dormant until construction of the Delta IV pad began. Thursday’s launch marks the twentieth Delta IV to lift off from the complex, and the twenty-eighth rocket in total. Thursday’s launch was the first mission of the year for the Delta IV and the second for United Launch Alliance following the successful deployment of NASA’s TDRS-L communications satellite in January. It was the United States’ fourth launch of the year; so far in 2014 the USA has conducted more launches than any other country. The next Delta IV launch is planned for mid-May with the next GPS satellite. ULA will next be in action with a late-March Atlas V launch deploying the NROL-67 payload for the National Reconnaissance Office.